1 NIVEAU RANCHER MAISON PRIVÉE, SÉCURITÉ CALME Facile À 45 min au sud de l’aéroport de Phoenix Skyharbour se trouve notre espace nouvellement agrandi de 1400 pieds carrés, et notre espace privatif de 700 pieds carrés. A 1,5 km du parcours de golf PGA Poston Butte et de la piscine olympique, des tableaux de plongée et des toboggans aquatiques, ainsi que du centre de loisirs de 45 000 pieds carrés. Tout ce que vous devez faire est de lecteur dans la CAR GARAGE DOUBLE et vous êtes à la maison. 2 chambres + den, 2 salles de bain complètes. PACKAGE DE CABLE DELUX DIRECTV complet, 3 téléviseurs à écran plat, haut débit sans fil dans toute la maison, appels illimités au Canada et aux États-Unis (rangez votre téléphone cellulaire!). La chambre principale dispose d'une grande salle de bains avec un grand walk-in et également 32 'TV avec satellite. La maison entière est décorée avec goût de style sud-ouest pour votre plaisir. La cour arrière est entièrement aménagée (style floral et désertique) avec une intimité totale où vous pourrez vous retirer le soir près d'un feu de camp extérieur, d'un barbecue, d'un bon vin de l'Arizona ou d'un rafraîchissement à la main et admirer notre magnifique ciel étoilé de l'Arizona ou profiter du monde célèbre coucher de soleil ou lever du soleil sur le désert de Sonoran. Des kilomètres et des kilomètres de nouveaux sentiers pédestres et cyclables pavés à explorer! Mots-clés: réservation tout compris, éleveur, 1 niveau, âge et mobilité réduite, Quite, Coffre-fort, Près du nouvel hôpital, Maison, maison, maison de vacances, maison privée, location de vacances, maison de vacances, propriété de vacances, escapade, détente, golf, vendredi noir spécial, vacances hivernales chaudes, escapade fièvre de la cabine, vacances snowbird, escapades, retraites snowbirds, 55 ans et plus, vallée du soleil et pays tonnerre, 3 casinos à moins de 45 minutes de route! Salle de bain principale avec WALK IN DOUBLE PORTE EN VERRE douche. Barbecue en plein air, foyer extérieur, réchaud à gaz, barbecue à gaz, vélos de montagne / vélos (2), équipement de pêche POUR POND approvisionné (en face du centre de remise en forme) et miles de nouveaux sentiers pavés de randonnée pédestre et de PICKELBALL! We were very disappointed to arrive and find out that this home was on the Parkside of Merrill Ranch instead of the Sun City Anthem side. We were looking forward to being able to use those facilities and were not able to. The house was very clean ... the furnishings were just adequate. Beds are only queen beds. The outdoor grill was very nice and the kitchen was stocked with what we needed. Thanks so much for your review. Yes, we've advertised our property is Anthem Parkside, walking distance the complementary Anthem Parkside Fitness Centre Membership and resident rates rates at the Poston Butte PGA golf course we provide at to guests at no additional cost. Yes, both bedrooms with their own bathrooms, are queens, and we have a 3rd inflatable queen bed for the office - if you have additional guests. So glad you enjoyed our 900sf outdoor living space and grill. Outdoor living, cooking and entertaining is a favourite activity for us and we stock our pantry with items from local organic and pesticide free nearby farms including Schnepff Peach Farm, The Olive Farm, The Pork Place, The Salsa Lady and Windmill Winery. Congratulations and welcome to the neighbourhood! clean, well maintained, would stay here again. Mike and I rented this property from December 1, 2016 - January 28, 2017. Its is an immaculate home, well equipped, and beautiful outside patio with grill. All the essentials included for meal prep, laundry, and housekeeping. The den was a perfect home office for us that included a printer. Plenty of linens for the bedrooms and baths, master bath with walk in shower was a delight. It was a pleasure to have you as our guests and so glad you enjoyed the outdoor grill and recently upgraded pavers in the backyard! We look forward to having you stay again when it works. We thoroughly enjoyed our stay. The house had everything we needed. We especially liked the short walk to the community centre where we worked out in the gym, swam lengths in the heated outdoor pool, and participated in the aquafit classes. You can pick up the monthly event calendar at the community centre. We participated in a number of the events. Everyone involved was very friendly and welcoming. The golf course was great and had excellent practice facilities and outdoor patio. We also enjoyed the food and atmosphere at the River Bottom Grill, a short drive from the Anthem Parkside community. Hiking at Saguaro National Park was another highlight. However, we so enjoyed the Parkside community and the amenities there that we rarely left. Thanks to Tamara and James for making the renting process so easy. We enjoyed our stay for the month of June, while waiting for our own house to be completed. The house was clean and well furnished and supplied. We appreciated spending summer mornings on the furnished patio, and having the community pool and facilities available. We have already recommended this VRBO to friends of ours who are considering coming here. So glad you enjoyed your stay and welcome to this lovely and wonderful community. First impressions are always important, and yes we found this home to be modern, beautifully landscaped, clean, comfortable, and well organized. Many hours were spent on the back patio, relaxing, barbequing, and enjoying the activity at the bird feeder. We really enjoyed the quietness of the neighborhood, and the walking distance to the classy Community Center/Pool/Fitness Center (which we used a lot). Because the home is located near Florence, be prepared for a little extra driving if you are keen in exploring Mesa/Phoenix, and surrounding communities. However, upon discovery of Felix Road we found ourselves exploring new roadways and shortcuts, allowing us to bypass busy roadways and traffic lights. Similarly, going southward/west via Attaway Road towards Coolidge, Eloy, Casa Grande, Arizona City, and Maricopa, using highways 87, 287, etc., resulted in exploring the sights and sounds of this immence valley. We hiked, cycled, dined, explored, visited friends, played card games, watched a lot of home movies, and golfed 20 days; all during our 45 day stay in this beautiful home at West Pleasant Oakway. We recommend checking-out The Grill at the Poston Butte Golf Course, which is reasonably priced; and the view is breathtaking. We golfed at 15 different courses, and the selection is endless. We were also very fortunate in meeting the owners, James and Tamara, prior to our trip; and want to thank them for their kindness, all advance information, and subsequent quick responses to our few questions. We would not hesitate to stay here again, and highly recommend it to others! It was our pleasure to have you as our guests. We're so pleased you were able to explore a multitude of courses and places on your way down and back! We hope to do the same one day too! Happy travels and hope to see you back again. Si le golf est votre passion, alors vous êtes dans le golf ciel. Il ya environ 50 terrains de golf à 25 miles de la maison pour aider à réduire et à améliorer ce handicap lancinante. Le plus populaire d'entre eux est le célèbre PGA Poston Butte Golf Course qui est moins d'un mile de distance. Pensez à apporter vos clubs et profiter de la grande diversité de la multitude de cours au choix. Soyez sûr de vérifier la Casa Grande Outlet Shopping, Florence Windmill Winery Tasting Room & Tours, Casa Grande Ruins National Monument, Olive Factory Tour, Trails San Tan Appartements régionaux pour le vélo et la randonnée, San Tan Appartements Patio extérieur et restaurant - le plus grand patio extérieur En Arizona, descendre la rivière Salt, PAYS THUNDER FESTIVAL DE MUSIQUE ou s'asseoir et se détendre. $150USD admin fee on cancellations. 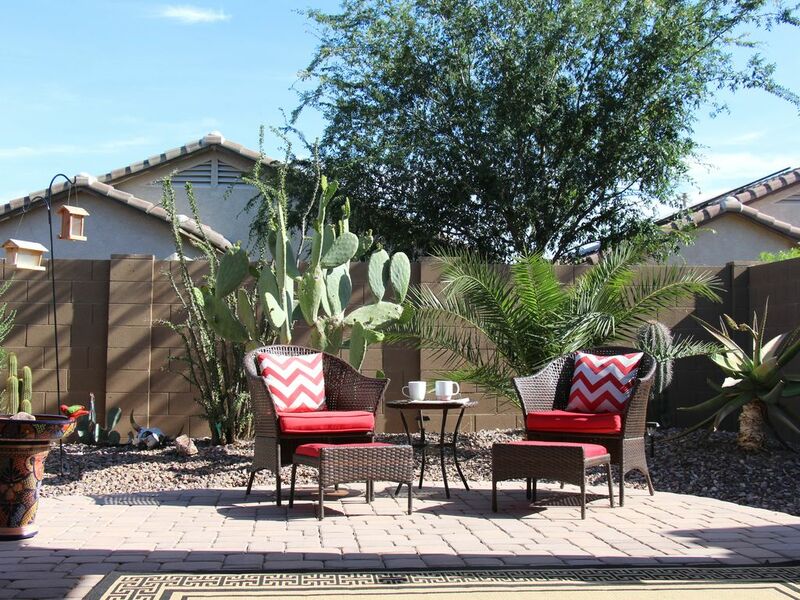 ESCAPE2ARIZONA@GMAIL.COM RENTAL TERMS: Rec Centre Access fee added for weekly bookings Section A: 1. CHECK-IN TIME 4 P.M. MST CHECK-OUT 11 A.M. MST. NO Early/late Check-inout without permission. 2. This is a NON SMOKING unit. 3. Pets are not permitted in rental under any conditions. 4. Renters under 25 years of age must be accompanied by an adult guardian or parent. 5. DAMAGE DEPOSIT-Required prior to arrival. The deposit is NOT applied toward rent; however, fully refundable within (14) days of departure, provided the following provisions are met. a. No damage is done to house or its contents, beyond normal wear and tear. b. No charges are incurred due to contraband, pets or smoking, all not permitted. c. All debris, rubbish and discards are placed in dumpster, and soiled dishes are cleaned and put away (ie. Toss ALL PERISHABLES). Dirty sheets and towels (bedroom linens) are placed in washing machine or on top in hamper. PLEASE DO NOT LEAVE THE HOUSE UNATTENDED WITH THE WASHER/DRYER GOING. Laundry will be done by the Cleaner. d. All keys are return to the key safe and the house is left locked. e. All charges accrued during the stay are paid prior to departure. f. No linens are lost or damaged. g. Email escape2arizona@gmail.com at least 24 hrs. prior to departure so the house sitter and cleaner may be notified. h. The renter(s) are not evicted by the owner(or representative), law enforcement or a security company. Section B 1.PAYMENT-50% of full amount is required to book and balance of payment (with damage deposit due 90 days prior to check in. 2.CANCELLATIONS-Ninety(90) or more days prior receive 100% refund*. 3.Cancellations made with less than (90) days notice are not refundable (other than the damage deposit) however you may send other guests in your place, subject to landlord approval 4. Utilities included to $250/month then billed at cost. 4. Rates for 2 guests (add $25/guest/night, max 4) 5. Rates include 1x towel setup.